Archives of Eaton Bray News for May 2006. A summary of this month's meetings, along with a downloadable copy of the full minutes is now available from the Parish Council website. Jamie Oliver himself may not have visited Eaton Bray Lower School, but he would be proud of the pukka recipes and enthusiasm of everyone involved with the new school dinners. The governors of the school have held meetings with catering specialists Scolarest and came up with a winning formula; a new cook and a new healthy option menu. On Wednesday afternoon, parents, governors, pupils and the head of Scolarest met to test-drive the new menu. 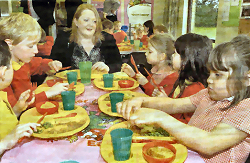 Head teacher Sue Hounslow said: "We are a high-achieving school and we wanted a school dinner to match. The children are now being given freshly-cooked healthy food. The next step is to create a real restaurant atmosphere where plastic trays are replaced with plates, and children fully engage in conversation and debate." Eaton Bray's third Beer Festival will take place on Friday June 2 and Saturday 3 in the village hall. This very popular beer festival promises to be even bigger and better than previous years, with more than a dozen fine ales plus perry and cider have been chosen by the friendly volunteers from CAMRA. All drinks are available from 6pm on Friday and from 12 noon on Saturday. For those of you accompanying the aficionados there will be plenty on offer including lager, wine and a good selection of soft drinks. There will be a variety of food available too, including jacket potatoes and a barbecue featuring burgers from Hines the Butchers of Eaton Bray. From 8pm there will be music to dance and drink to: Friday is Bob Thompson and Saturday stars Paul Greenie, ex lead guitar with Suzie Q.
Saturday afternoon is family time with a magician for the young and young at heart at 2pm. The event is being organised by Eaton Bray Village Hall Trustees to help finance stage two of the hall's redevelopment. This group has raised over £25,000 in under three years. For more information contact Ross Bagni. Anyone fascinated by the history of Eaton Bray should make a date to visit the village church this Sunday afternoon. A talk on the history of the manor of Eaton Bray, covering the period from 1066 until the dissolution of the monasteries by Henry VIII in the 16th century, is being given as part of the church trail scheme organised by St Mary's. The talk will include information about Lord of the Manor, Reginald Bray, who was a national figure with connections to St George's Chapel, Windsor. Afterwards there will be tours of the church to learn more about the building's provenance, at 2.30pm and 4pm. For more information visit www.stmaryseatonbray.org.uk. Eaton Bray Lower School entered a team of winners in the Bedfordshire and Luton area final of the K'Nex Challenge 2006 at Cranfield University on Friday. They were Benjamin Baker and Benjamin Johnson (both in Year 4) who had won the school heat of the event earlier in the year. The area heat of the national competition for pupils aged from seven to 11 involved schools from all over Bedfordshire and Luton, including lower, middle and primary schools up to Year 6. The brief was to design and build a theme park ride out of K'Nex, and the two Bens produced an excellent design thanks to superb teamwork. Their design was chosen as the overall winner out of 57, and the judges congratulated them on their hard work commenting on how good their design was considering they were up against teams of older children up to the age of 11. 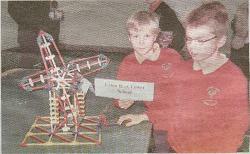 The boys won a K'Nex set for their school and a box of K'Nex each. They will now be one of two teams representing the Bedfordshire and Luton area in the Anglia regional finals of the challenge in July. Edlesborough couple Eric and Maureen Gunn celebrated their diamond wedding anniversary last Saturday with family and friends. The couple's four children, Anne, Catherine, Clive and Susan, held a party for them in St Mary's Village Hall, Eaton Bray, which more than 100 people attended. 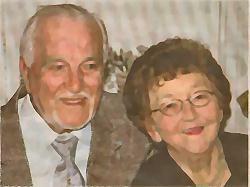 Eric and Maureen, of Pebblemoor, were married on May 13, 1946, in Penang, Malaysia. Eric was based there during the war and met Maureen at the army headquarters where she worked as a secretary. On returning to England, Eric worked at Battersea Power Station in the accounts departments and Maureen became a full time mum. Son Clive describes his parents as "still very much in love" 60 years on. The pair have eight grandchildren and three great grandchildren. Maureen (80) and Eric (86) keep themselves busy with many hobbies. Maureen is a superb cook, and she also enjoys gardening, sewing, and knitting. House-husband Eric also likes gardening, but particularly enjoys antique viewing and painting among many other interests. So what's been their secret to a long and happy marriage? Well the couple think, like most, "give and take" - although Eric wasn't sure of the percentage! But they firmly believe being good friends as well as being in love has made their marriage last. A brave mum who has fought cancer for 17 years will attend the premiere of a film about her battle next month. Liz Farr, 55, of Woodside, Eaton Bray has already recorded a CD of a song she wrote and set to music as a tribute to the family and friends who have supported her through her ordeal. She lost two husbands to cancer, before being diagnosed with the disease herself. It was discovered in her breast and has now spread to her spine and liver. Liz sang her Thank You Song to a church congregation of more than 1,000 at St Albans in December. All proceeds from the CD are going to charity and she wants it player at her funeral. "It sums up how I'd like to be remembered - as someone who always managed to smile and be positive, no matter what, she said." But in the meanwhile she's too busy living to think about dying. She and her partner Clive are doing all in their power to fight the disease together. They've adopted a new lifestyle and a strict cancer-friendly diet to accompany and complement her conventional medical treatment. Now her son Rob, a film graduate, has made a documentary about her positive and holistic approach to her illness. He wants to share it with others so they can be uplifted and inspired by his mother's journey. Making A Song And Dance About Cancer will be shown at the beautiful art deco Rex Cinema in Berkhamsted. Tickets are free but all donations will go to the Dunstable-based charity Gentle Touch Healing, whose hands-on treatment has helped and strengthened Liz as she comes to tems with what lies ahead. She said: "I known I'm dying of cancer, but I'm going to spend whatever time I have left helping others cope with it." Gentle Touch founder Ray Wilson said: "Liz is a very brave and couragous person who brings joy to many with her buoyant and infectious personality." Making A Song And Dance About Cancer will be shown on Friday, June 9 at the Rex Cinema, High Street, Berkhamsted. Tel: 01442 877 759. 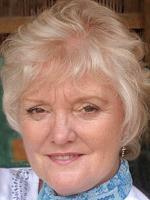 Visit Liz Farr's website www.thankyousong.co.uk to order the CD and for more details about her life. Police are using new legislation to crack down on gangs of youths who blight the lives of people living in Eaton Bray. From May 26, the village is to become the subject of an official dispersal order, meaning officers will have the power to move on groups whose behaviour is intimidating, harassing, alarming or causing distress to residents. The order, which was approved by South Beds District Council, means individuals can be excluded from the area for up to 24 hours and arrested if they refuse to co-operate. It also means police, who will continue to take action against anyone committing a criminal offence, can take home any under 16-year-old found unsupervised and causing problems after 9pm. Beds Police beat manager PC Neville Johnson said the dispersal order is designed to prevent residents feeling threatened by groups hanging around public spaces and causing problems. It is not a curfew and law-abiding young people have nothing to fear. Notices highlighting the order, which will last for six months, are being placed in shop windows, at entrances to the village and in the local press. PC Johnson said: "Eaton Bray is not noted for having excessive levels of anti-social behaviour, although there have been problems with a minority of young people spoiling it for others. "Dispersal orders are not used in isolation, but are part of an integrated series of measures implemented across the division to discourage anti-social behaviour. "These measures include everything from test purchase operations to reduce under-age drinking to Acceptable Behaviour Contracts and more serious Anti-Social Behaviour Orders. "With the holidays approaching, parents can help us by asking where their children are and what they are up to. It is also helpful to ensure there is no unsupervised access to alcohol in the home." Thursday 8th, Friday 9th and Saturday 10th June at Eaton Bray Village Hall. Doors open 7.30pm, Licensed bar. What unseemly horrors stalk the gloomy corridors of Greenacres stately home? What evil deeds are afoot and what dark secrets fester behind the oak panelling? Who is Nikkamoppaloffkis and what has he got to do with anything? We dare you to take your seats for this hilarious tale of murderous morbidity! In March, you may remember how we told you "Christmas was coming but not before our Auction of Promises". Well Christmas did come to us old GI's and the young HSA folk. To the tune of £4,200! Yes you folk of Eaton Bray came to our Auction and went wild for all the super promises we auctioned off. We must not forget the kind people who promised the Promise, these included physical goods, their time and skills, in many cases at considerable expense to themselves. Thank you ALL. Thank you again for your support and generosity, which will help to continue the redevelopment of the Hall and the School to develop a new outdoor garden for the children (maybe they will even have enough over to buy some seends). The next Village Hall fund raising event is the Third Eaton Bray CAMRA Beer Festival - Evening of Friday 2nd June and all day Saturday 3rd June. The coffee morning in April in aid of SMILE was a great success, thank you to everyone that supported us and to Sandra and Kitty and all their helpers, especially the 3 chefs John, Graham and Ted for their delicious lunches. A total of £500 was raised for this special Charity. On Saturday May 13th we are holding a Plant Sale and Coffee Morning with Cake stall etc, from 10.00am until 12.00 noon. Do come along and maybe bring any plants, cuttings etc. that are surplus to your requirements. The proceeds are for Church Funds. The following day it will be our Sunday School Anniversary, Sunday May 14th at 10.30am. The young people's theme will be Images of Jesus and they will be ably assisted by our preacher, Fiona Arscott-Smith and our friends in the Trinity Band. This promises to be a very special and happy occasion and we invite you to join us. Please put this date in your diary: Saturday June 17th from 12.00 noon. Once again we are holding our Garden Fete at the home of Jane, James and Nikki Mcfarland. Lunches will be served, there will be various stalls and games with ample parking - Fun for all the family! Our Film theme Carnival Day is getting closer and this year we have a special Goods Collection Day on Sunday 11 June at Eaton Bray Village Hall from 12.00noon to 3.00pm. If you have items to donate to a stall at the carnival, we want to make it easy for you! Don't hang on to that clutter - instead, bring it along to the hall and allow our team of volunteers to help store and get your much needed donated items to the big event. Here is a list of what we are looking for... but please... no items of bulky furniture or junk. What do we want to collect? We need plenty of these items to sell at the Carnival, and remember that every penny of our profit goes straight to local charities and good causes. Donating goods is a really easy way to help. The success of our carnival relies on the generosity of spirit of our villagers – that's why the St. Mary's Village Carnival has become such an outstanding success. As Nick Wormley Editor of the Leighton Buzzard Observer says, "St Mary's Village Carnival is the biggest event of its kind in the area, and continues to grow in popularity, always attracting a huge audience for a very entertaining day out..." The Leighton Buzzard Observer is once again giving its generous support to our carnival this year by sponsoring our Best Dressed House Competition. You could be a winner this year! Get inspiration from your favourite movie and create an eye catching display at your home for 1st July. To find out more about our carnival or to offer help please visit www.stmarysvillagecarnival.com. You can also get more info or offer help by contacting Peter Bennett. In preparation for the week, there will be a coffee morning in Eaton Bray Methodist Church on Saturday, 6th May, from 10am to 12am. This will be an opportunity for the collectors to receive their pack and goodies and for everyone else to show their support for our 4 village effort for this charity. The Week will start with our "Hunger Lunch" at Eaton Bray Village Hall on Sunday 14th May, from 12noon. Later in the same day, there will be a United Service at Northall Baptist Church at 6pm. We are hoping this year to involve some of our schools in various activities. Please don't forget to support us. Thank you all for a magnificent response last year. Can we break another record this year? Our Film theme Carnival Day is getting closer and this year we have a special Goods Collection Day on Sunday 11 June at Eaton Bray Village Hall from 12.00noon to 3.00pm. If you have items to donate to a stall at the carnival, we want to make it easy for you! Don't hang on to that clutter - instead, bring it along to the hall and allow our team of volunteers to help store and get your much needed donated items to the big event. Here is a list of what we are looking for... but please... no items of bulky furniture or junk. You are viewing the May 2006 archive.